14 | November | 2008 | can i just finish my waffle? 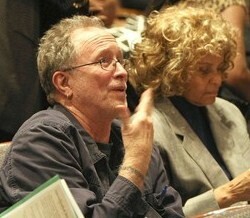 Bill Ayers, former 1960s radical activist turned college professor, listens to Rev. Jeremiah Wright Jr. speak at Northwestern University on November 7, 2008, during an event hosted by Northwestern’s Black Student Alliance. In a new afterword to his memoir, “Fugitive Days,” 1960s radical William Ayers describes himself as a “family friend” of President-elect Barack Obama and writes that the campaign controversy over their relationship was an effort by Obama’s political enemies to “deepen a dishonest narrative” about the candidate. Now a professor at the University of Illinois at Chicago and an expert on public school reform, Ayers was a member of the Weather Underground, a radical organization that claimed responsibility for a dozen bombings from 1970 to 1974. 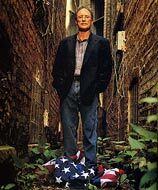 Ayers lamented that his relationship with Obama became an issue. I hate to say I toldja’ so, but it’s…..